Click here for Winter Sign-ups. Deadline is Nov 17. Buy your 50/50 raffle tickets at pickup–proceeds benefit our Subsidized Share Program. Register online to reserve a table at the annual CSA Holiday Market. And, here’s what’s in the box tomorrow, November 2nd, at Sunnyside Community Services from 5-8pm. Fruit shares this week are a bag of bosc pears and mutsu apples. Radiccio – A pretty purple addition for this week–similar to last week’s chicory in flavor. Use within 5 days. Leeks – Need another leek recipe? Check out Golden Earthworm’s Facebook page! Use within a week. Kohlrabi – A nutty-flavored bulb that’s good raw or cooked. Use within 5 days. 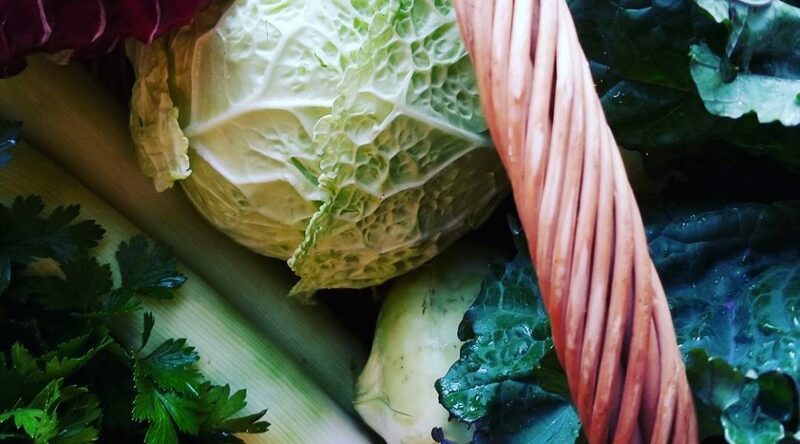 Savoy Cabbage – A frilly cabbage that works great cooked or in salads. Use within 5 days. Toscano Kale – Here for another week to ensure you’re getting your greens in! Use within 5 days. Parsley – Bring on the plethora of vitamins!! Use within 5 days. Please note that any boxes not picked up by 8pm will be donated to SCS, and items are subject to change. Look for Golden Earthworm Organic Farm CSA on Facebook for more recipes from members. All pickups are on Thursdays, 5pm-8pm, at Sunnyside Community Services (43-31 39th Street, Sunnyside). Who’s ready for summer veggies?